Last blog post for the year 2011! Someone asked me recently; UCT OpenContent has grown quite significantly over the past year (we now have 164 OER’s shared from UCT! ), where are all of these resources hosted? Since we don’t yet have a formal institutional repository here at UCT we don’t have all of our resources stored in one central location. This adds a significant amount of complexity to managing our collection, but there are reasons for not putting all of our eggs in one basket. A decision made very early in the OER project was to host resources wherever they made most sense to host. We believe that the type of resource should dictate the most suitable hosting space; for instance, images may be best hosted on websites in the cloud such as Flickr to take advantage of tagging, linking and geo-location facilities. So we decided not to try and put everything into a central repository such as ePrints or dSpace. UCT OpenContent is in actuality a referatory, which hosts metadata about resources shared at UCT. These resources may be hosted wherever the creator deems most appropriate (we often also help to advise people on where to host their resources). I ran a quick analysis of the web locations of the resources currently in UCT OpenContent. As one might expect, most of the resources are hosted on websites administered by the institution. 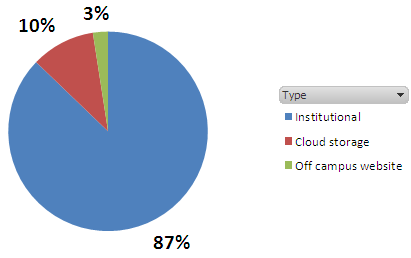 In total 143 resources are being hosted on sites managed on campus. Additionally, off campus sites like Youtube, Vimeo, Slideshare and other cloud based media storage sites host 17 of our resources and 4 are hosted on off campus project websites. 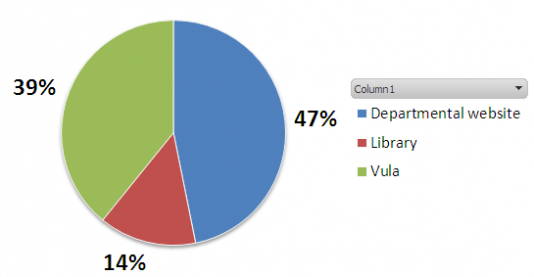 Of the 143 resources hosted on campus, 67 of those sit on departmental websites, 56 on the institutional learning management system – Vula, and 20 on sites associated with the library. Interesting to note where people choose to host their resources when faced with no definitive solution for hosting content. A quick overview of how the different faculties host their resources is reflected below. Commerce and Law have the most diverse array of content hosts; on institutional, off campus and cloud based websites. All of the resources shared from the Faculty of Science, Health Sciences and Engineering and the Build Environment are hosted on campus. Resources from the Centre for Higher Education Development and Humanities are hosted on institutional and cloud based websites. The type of media being shared does not necessarily dictate where the resource will be hosted as shown in the following graph which shows where resources are hosted according to the media type. As we move towards OpenUCT we expect to see an ever more diverse array of content being shared. Metadata allows us to create virtual collections by grouping and linking resources to one another regardless of where they sit on the web. This requires quite a new type of curation skill as well as new roles for content creators in describing and linking their online content. Where resources are hosted on UCT OpenContent by Michael Paskevicius is licensed under a Creative Commons Attribution 4.0 International License.